"A box" is a boxed (CD/DVD) retail version of Captain Sim products released by a third party publisher. The last box was released in 2010, since then all new Captain Sim products are available via download only. Unfortunately, updates for download versions do not work with the boxes because the products go through different development cycles and may vary. A valid Order Number is required for login. The 767 Aerosoft box: you can find the Order Number on the box. 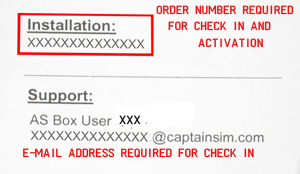 All other boxes: Unfortunately as you do not have the Order Number, you technically cannot login to the Captain Sim Customer Support services. For support please contact the box publishers directly. But everyone is welcome to use Captain Sim Forums.